For all regions outside of the UK, payment is via credit or debit card subscription (via Stripe) and therefore when the card expires you will need to link up the new card to your account. Please note we are unable to accept cheques or card payments by phone. Click on the Billing menu. On the right-hand side of the screen is the Payment Configuration message. 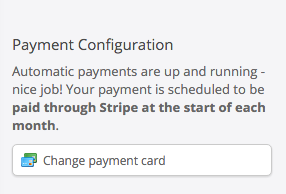 Click the "Change payment card" button. This will take you through the process of setting up the new card details. If you need to change the bank account that is linked to your GoCardless Direct Debit for ChurchSuite, please email us at support@churchsuite.com to let us know. As soon as we receive your email we will amend your current payment method to a status of "cancelled". This won't cancel the Direct Debit, but it does tell ChurchSuite not to use those details when billing in the future. We will advise you by email when this change has been made and at that point, you will see the "Pay by monthly Direct Debit" button appear under Administrator > Billing. You can then enter the new bank account details to complete the update.